We have written how to contact for get unbanned on WhatsApp in our recent pages on How to Chat Online. 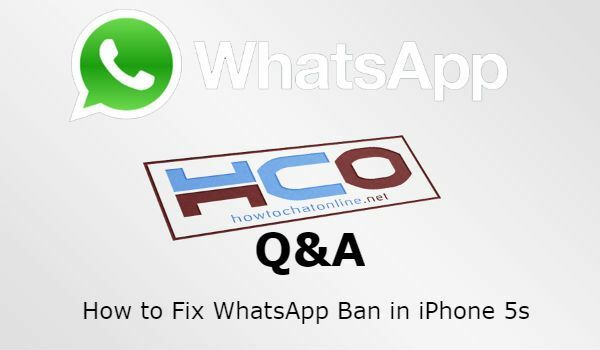 One of our users from Singapore got a negative answer from WhatsApp staff and he wants to know if there is any solution or a fix for WhatsApp Ban iPhone 5s. We are going to answer his question on here. Question Hi, My number has been banned by WhatsApp I’ve written to WhatsApp and got a standard reply that I’ve been banned I wrote again, no more reply from them. Are you able to assist please ? Expert Note: We have removed your phone number for your privacy. There is a Way to Fix to Ban of WhatsApp? We got a similar question recently, you can check here for more information: WhatsApp Told Me Decided to Keep Your Account Banned. What I will tell in your questions is going to be the same story. Unfortunately there is not any way to fix a ban of WhatsApp in this situation. There is no code, software, application or something else which will help you to remove ban. Once WhatsApp has banned your phone number, it is blacklisted on WhatsApp database. Unfortunately those bans are not temporarily. They are going to be forever. I know this is annoying. However that is the truth. There are too much unrealistic information on websites about removing ban. However nothing can unban your account but WhatsApp itself. Generally WhatsApp/Facebook/Messenger (Facebook owns them all) are using standard replies to users on those situations. If they even halt those ban process, you would again got a standard reply. After they investigate the issue, they are making the final decision. Unfortunately there is only one fix this problem and I believe it is not the solution that you are looking for… It is changing your phone number. However there are things that you should be careful before changing the number. To get more information on this, see this information: New Phone Number Can Get Banned After Installation? It is what I can tell about this situation at the moment. I am sorry that I can’t help you much for that. However if the situation changes at the WhatsApp side, we are going to update this information on this page.